The power bridges have been designed for bi-wiring in line with our nextgen™ technology. The conductor material consists of pure copper (Cu) or fine silver (Ag) which gives the bridges excellent conductivity. Oxidation of the surface is prevented by the gold plating of the copper version and platinum plating of the silver version. A transparent Makrolon insulation provides 100 % contact protection and CE- and IEC conformity. The WBT-0725 is additionally equipped with inlaid Elastomer for vibration damping. 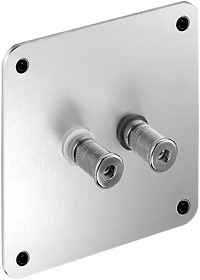 The mounting plates permit the perfect installation of WBT pole terminals onto the rear wall of loudspeakers. 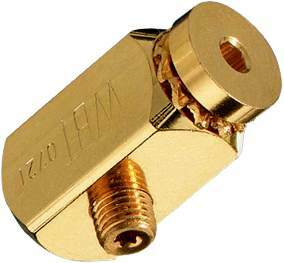 A solid brass plate (the WBT-0716 is gold-plated and the WBT-0719 has a Velours Chromium Finish) and a round counter plate hold the terminals at a 30 mm distance and prevent turning and loosening. 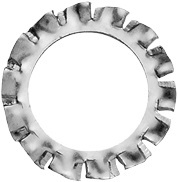 The serrated lock washer WBT-9150 is provided as part of the standard supply. The WBT-0715 makes possible the installation of WBT pole terminals in loudspeaker housings with a wall thickness in excess of 9 mm and where a mounting plate cannot be used. The WBT-0715 can be simply screwed on to the threaded bolt of the WBT terminal and permits installation up to a wall thickness of 50 mm. A fixing nut and a serrated lock washer for extra hold are provided as part of the standard supply. Important: The cable for internal contact should be soldered or screwed on to the pole terminal as usual. The WBT-0715 is an installation help and is not part of the signal path. The extension bolt can be used with all WBT pole terminals (with the exception of the WBT-0710 series!). The terminal block provides the ideal solution when crimped cables up to 10 mm² (7 AWG) must be connected to a printed circuit board. The copper alloy base material provides excellent conductivity and a gold-plating prevents surface corrosion. 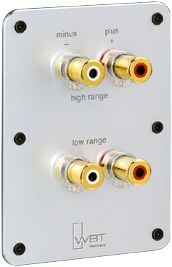 The terminal can be mounted vertically or horizontally. 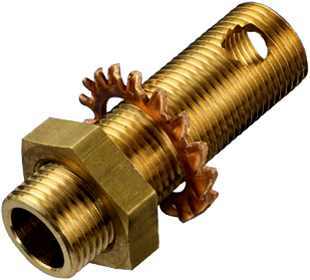 An antifatigue bolt and serrated lock washer permit a secure fit. The Safety Stick is a blanking plug available for manufacturers who wish to close the 4 mm banana plug hole in accordance with CE and IEC safety requirements. 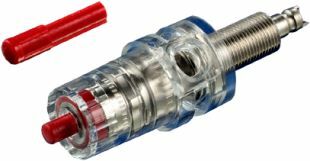 WBT Topline pole terminals (including the Signature version of the WBT-0702 and WBT-0730) are equipped as a standard with the Torx¹ screw for crimped connection. 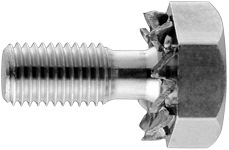 The WBT-9126 Torx screw with a length of 7 mm is intended for use with Midline pole terminals such as WBT-0763 and WBT-0765 as well as the Economy terminals WBT-0780 und WBT-0785. Thanks to their length of 7 mm both thinner and thicker crimped cables can be connected. 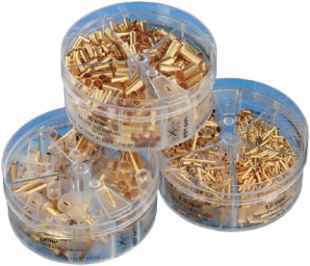 WBT crimp connections only use screws with Torx drive (Torx 6) and special fine thread, providing a durable firm hold. The base material is brass. ¹ Torx is a registered trademark of Camcar Textron, USA. The serrated lock washer can be used with all WBT pole terminals. 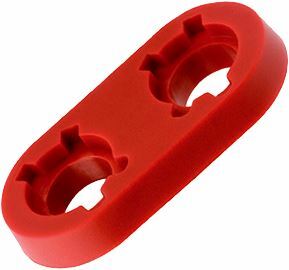 The fine toothed washer grips the cabinet housing or puzzle plate from the inside after screwing on the counternut and provides maximum firm hold for the pole terminal. 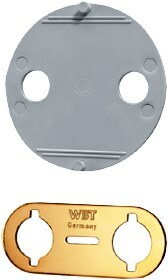 The puzzle plates are part of the standard supply of every WBT pole terminal. WBT pole terminals are protected against twisting thanks to the ‘nose’ present on the double step washer. This protection can (and should!) be optimised through use of the puzzle plate. 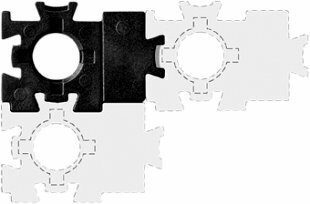 In this case the distance between terminals has to be selected at 30 mm or 19 mm so that two terminals can be clipped together with the puzzle plate. The counternuts are available with a chromalized (WBT-9302) or gold plated (WBT-9303) surface. Every WBT pole terminal is supplied with a counter nut. 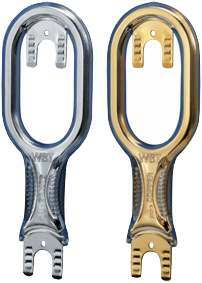 The anti-fatigue bolt is intended for use with the Economy pole terminals WBT-0780 and WBT-0785. It permits the use with these terminals, of a ring lug as well as direct screw fixing on to a printed circuit board for the internal connection. Standard supply includes a small serrated lock washer which guarantees an added firm hold. The mounting plates were developed for the professional mounting of all WBT pole terminals. They comprise of a solid 3 mm thick aluminium plate which has rounded edges of 10 mm radius. Six or four fixing holes with counting sinking for cylinder head screws permit fixing on to the loudspeaker housing. 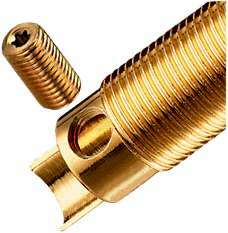 Brass straddling dowels are available upon request for metric threads. The plates can be mounted directly onto the housing or countersunk. Thanks to their stability, it is possible to mount a crossover onto the rear side of the plate. Screws and a cellular rubber seal form part of the standard supply. Made to order sizes or laser engraving with, for example a type plate or company logo are available upon request. The plates are suitable for use with all WBT pole terminals. They are ideal for loudspeaker manufacturers or audiophiles who would like to swap their standard pole terminals for WBT terminals. The terminal distances on the bi-wiring mounting plates have been so constructed that the use of the WBT-0725 and WBT-0726 power bridges is possible.